Kenneth Arnold's report, which described the objects he saw as "flying like a saucer skipping on water," triggered a national chain-reaction of sightings of bizarre disk-like aerial objects that threatened to crowd all other news from the front pages of America's newspapers by the end of the first week of July. By July 7, reports surfaced that several of the disks had crashed -- in places as diverse as Louisiana, California, Wisconsin, Iowa and Ohio -- but the debris retrieved at the supposed crash sites turned out to be the result of obvious hoaxes or misidentifications. Then, on the afternoon of the 8th, the Public Information Officer of Roswell Army Air Field, New Mexico, issued a stunning press release informing the world that the base, which was home to the world's only unit capable of delivering the atomic bomb, had come into possession of pieces of a flying disk that had fallen a few days prior on a remote ranch. The next day, however, as the suspected disk debris was being flown to Air Materiel Command Headquarters in Dayton, Ohio for analysis, it was intercepted during a layover in Fort Worth, Texas and scrutinized by skeptical officers who promptly identified it as pieces of a kite-like radar reflector used as an aid in tracking the flight path of meteorological balloons. Ridicule of crashed saucer reports now had a hook to hang on -- it looked as though even the Air Force could be fooled by a mere balloon. Within a few weeks, judging by newspaper coverage, the flying saucer craze seemed to blow over. The initial incidents of reported disk crashes had been promptly investigated by local FBI, Air Force and Naval Intelligence units, but the FBI soon bowed out, miffed at the Air Force's attempt to corner the market on the investigation of apparently genuine saucer debris while leaving obvious hoaxes to the civilian agency. By late September 1947 the Air Force had decided that a persistent flow of seemingly reliable reports of unusual aerial objects, especially by military personnel, was significant enough to warrant the creation of a formal, secret flying saucer analysis project within its Wright Field technical laboratories. On January 22, 1948, Project "Sign" began operations as a subdivision of the Technical Intelligence Division of Air Materiel Command, the same organization that had been responsible for analyzing the performance of German and Japanese warplanes and rockets during World War II. If one word characterized the postwar Truman administration, it would be "chaotic." The rivalries between the Army, Navy and newly-created Air Force were so intense that they frequently spilled onto newspaper front pages. In 1949 a group of high-profile senior Navy officers, fearing that the Air Force would be given a monopoly over nuclear weapons, conducted a bitter publicity campaign against administration defense policy in what became known as the "Revolt of the Admirals". The Truman era was famous for its "policy by leaks," with proponents of various special interests actively using favorite media sources as conduits for their opinions and beliefs. Not surprisingly, given the general atmosphere within the armed forces, the UFO investigation team itself was soon split by controversy. An important faction of its personnel quickly came to the conclusion that the flying saucers were real, and that because of their fantastic performance they had to be actual extraterrestrial spaceships. An opposing group within Air Force Intelligence held out the possibility that at least some of the saucers might be terrestrial aircraft -- secret weapons of extremely advanced design. 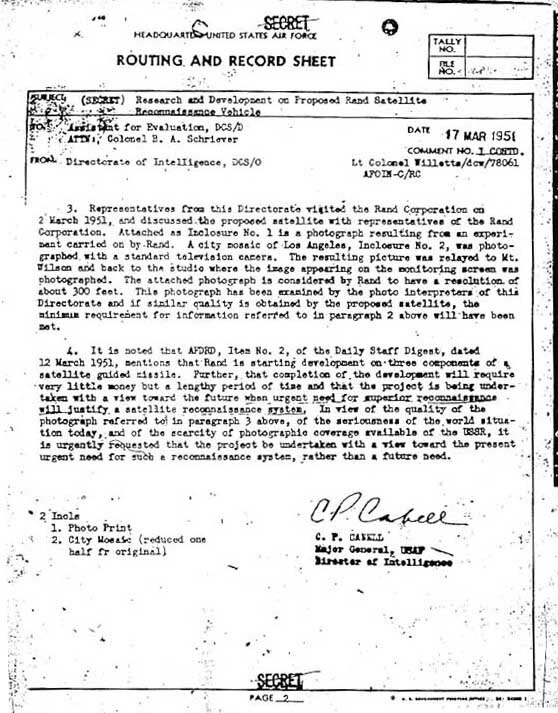 By early August 1948, Project Sign's "extraterrestrial" faction produced a Top Secret analysis of the flying saucer evidence titled "Estimate of the Situation" and circulated it through intelligence channels in an attempt to warn higher echelons of the presence of extraterrestrial spaceships in the nation's airspace. The worried believers were disappointed when USAF Chief of Staff General Hoyt Vandenberg refused to accept what he considered the overwrought conclusions of the Estimate. Meanwhile, the rival "secret weapon" faction of Air Intelligence had been busily collecting data to support its own arguments and soon issued its own Top Secret study which made the only slightly less incredible assertion that some saucers sighted to date bore a close resemblance to prototype flying wing jet fighters built by Nazi Germany the closing days of World War II. Under this theory, flying saucers might be highly advanced Soviet vehicles on reconnaissance missions over US territory -- or at the very least, the objects might be covertly produced, high performance flying-wing-like machines of US origin, somewhat similar to Jack Northrop's giant flying wing bombers or the Navy's disk-shaped XF5U-1 "Flying Flapjack" experimental VTOL fighter. Senior Air Force officials were unconvinced by this argument as well, and Project Sign's final report, issued in February 1949, offered no firm conclusion as to the origin or reality of the saucers. The director of the Pentagon's Office of Air Force Intelligence, General Charles Pearre Cabell, evidently was "on the fence" about the reality of UFOs, and documentation exists proving that on several occasions in the 1948-51 period Cabell personally ordered the Wright Field saucer project's staffers to make immediate on-site studies of particularly intriguing cases. Whatever Cabell's personal opinions about saucers were, his superiors, including Hoyt Vandenberg and Nathan Twining, were apparently resolute skeptics. By early 1949 the Project Sign extraterrestrial faction was disbanded, the name of the saucer analysis effort was changed to the tough-sounding "Project Grudge" and the project's concentration was now on the physiology of optical illusions and the military and psychological implications of belief in unidentified flying objects. Even before the Project Sign final report had been delivered, the Air Force reached an agreement with well-known writer Sidney Shalett from the widely read magazine The Saturday Evening Post to provide information for a major saucer-busting article. Shalett was given access to several top USAF generals, all heroes of World War II, including Vandenberg, Twining, Curtis LeMay and Carl Spaatz, each of whom offered a lighthearted anecdote about how he had seen a flying saucer which, after a bit of calm study, had turned out to be a trick of light or some other mundane phenomenon. In his article, Shalett lightly mocked the extraterrestrial hypothesis and theorized that war jitters were probably behind much of the flying saucer scare. He also raised the idea that the Soviets might be testing secret weapons over the US, but noted that Air Force Intelligence rejected this idea for obvious reasons. Shalett glibly pointed out that "it also is reasonable to wonder why, out of more than 250 reported saucers, not one has crashed so we could lay hands on a tangible bit of evidence; so far, Air Intelligence does not have so much as one loose nut off any unexplained object to examine." Shalett concluded his May 7 article with an exhortation to the American public: if you see a flying saucer, before you call the local newspaper, try your best to estimate how high the object is, how fast it's going, and what it looks like. Take a photo or make a sketch, and if opportunity presents itself, try to obtain physical evidence of its passage. "Then," Shalett directed Mr. and Mrs. America, "sit down and write a letter containing all this information to Technical Intelligence Division, Air Materiel Command Headquarters, Wright-Patterson Air Force Base, Dayton, Ohio. At the same time, maybe you'd better buttress yourself with an affidavit from your clergyman, doctor or banker. If you've really seen something and can prove it, you may scare the wits out of the United States Air Force, but it will be grateful to you." 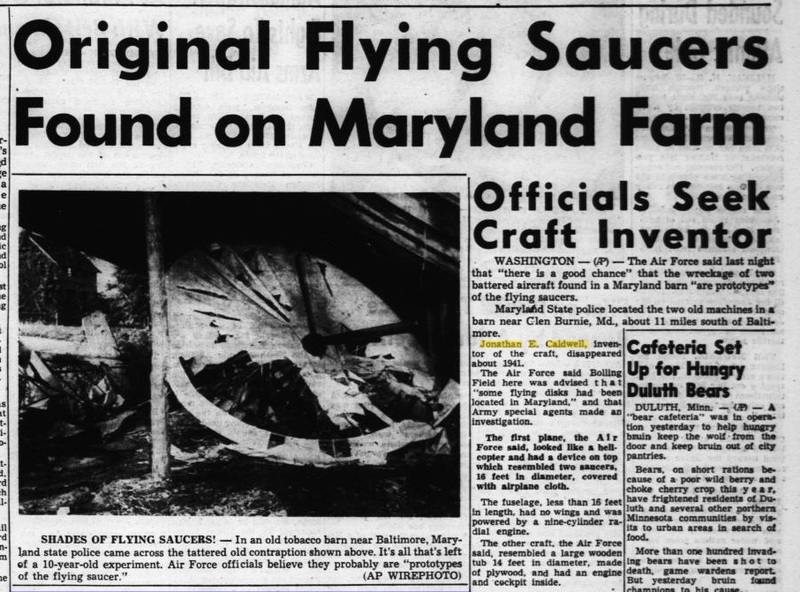 According to later news articles, one of Jonathan E. Caldwell's stockholders, a resident of Maryland's Eastern Shore, apparently read Shalett's article, remembered the 1939 Rotorplane demonstration and wrote to the Air Force in May suggesting that Caldwell's disk-winged planes might have something to do with the flying saucer phenomenon. The letter meandered through the bureaucracy and finally ended up in the Air Force Inspector General's Office of Special Investigations headquarters at Bolling Field in Washington, DC. From there orders went down to Captain Claudius Belk, head of OSI's District 4, in Baltimore, sometime in June: find Jonathan Caldwell and his planes, pronto. Belk and his assistant Special Agent Von Maucher had a bit of trouble carrying out their assignment -- no one seemed to have any information on the long-forgotten, decade-old experiments, Caldwell had vanished and descriptions of his test site were vague. Belk approached the Maryland State Police for help, and two Anne Arundel County officers, John J. Harbaugh and Peter Kosirowski, were assigned to the job. In early August they managed to narrow the search to the Glen Burnie area, and by going house to house, finally homed in on Pumphrey's farm. On Friday morning, August 19, Belk, Harbaugh and Kosirowski made their move. Along with a photographer from the Baltimore Evening Sun, they broke into the old tobacco shed. The Sun's editors clearly thought they were on top of a big breaking story. Page one of that evening's edition was plastered with the two-inch banner headline "'FLYING SAUCERS' FOUND IN MD." At the time, all the paper knew was that the Air Force seemed hell-bent on locating a mysterious inventor named Caldwell who had built the two saucer-like machines in Baltimore a decade before, and that Caldwell had disappeared under mysterious circumstances. It was a dream story for the Sun. Baltimore was home to the huge Glenn Martin Aircraft plant, one of the biggest military airplane manufacturers in the country; the Glen Burnie saucer story was bound to have a big audience. Sun reporters managed to track down John Ganz, the mechanic who had helped Caldwell build the Rotorplane, and pumped him for information about the craft. 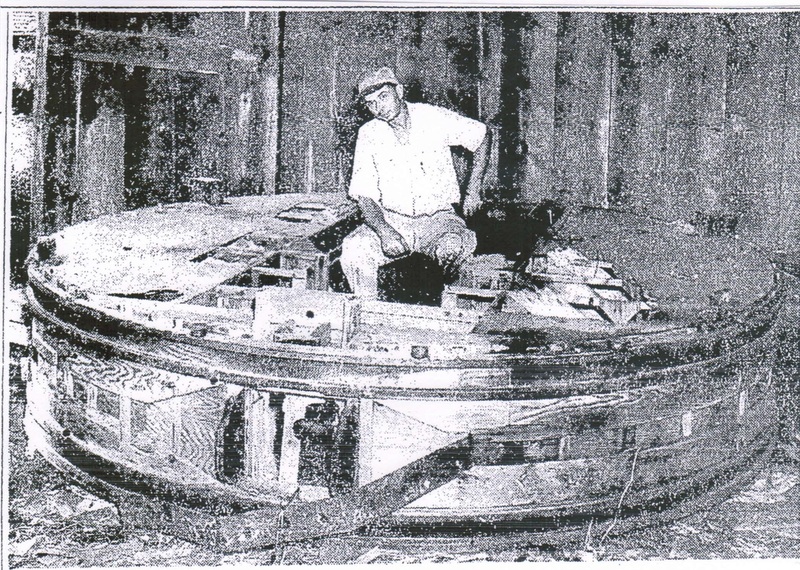 Ganz posed forlornly with pieces of the rotting Rotorplane and opined that Caldwell had been "ten years ahead of his time" in his aeronautical theories. 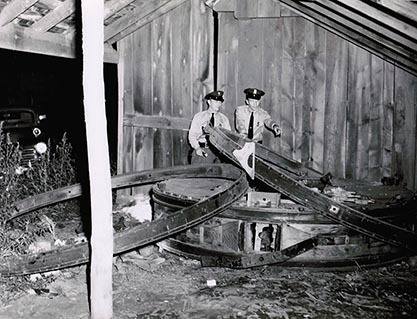 Late on the evening of the 19th, an Army flatbed truck pulled up to Pumphrey's tobacco shed and hauled the remains of the Gray Goose autogyro to Officer Harbaugh's home, where it could be kept safe from the curiosity seekers that would inevitably arrive after the story hit the media. Captain Belk told reporters that it would be stored there until higher echelons decided whether it should be shipped to the Technical Intelligence Division at Wright Field for tests. The Rotorplane was too awkward to move and was left behind. Meanwhile, in Washington, Sun correspondents were busily hunting down Air Force officials who were willing to talk about the Caldwell affair. Col. William Turner, the executive officer on duty in the Pentagon Air Intelligence office, had to tell them that no word had been received there so far. The reporters kept digging, sensing a major story, and they found one. Sometime on the evening of August 19, a US Air Force official in Washington told the Sun's capitol bureau correspondent that on the basis of the information he had seen, he believed that the Caldwell planes were "definitely the prototype of the flying saucer," that both conformed in general description to saucers seen over the United States, and that he believed that greatly improved models were now flying. The official declined to permit publication of his name, but assured the Sun reporter that "high authorities of the Air Force had given him permission to make a statement concerning the Glen Burnie discovery." "I personally think," the unidentified spokesman continued," [that] the inventor went to some other part of the country and that he -- or someone else -- developed new planes along these lines and is sending them up." "Officer X" -- who was obviously a member of the "terrestrial secret weapon" faction of military flying saucer analysts -- noted that while the original Gray Goose autogyro would look like a saucer in flight when seen from below, since its fuselage would be masked beneath the circular wing, the more advanced Rotorplane actually was a flying disk, complete with a canopy dome, and in fully developed form would have been capable of moving vertically, hovering, and flying in any horizontal direction, just like a "real flying saucer." When the reporter expressed skepticism that Caldwell's technology could produce the extreme speeds attributed to flying saucers, the anonymous official assured him that the Rotorplane could achieve such performance "with proper propelling equipment" -- presumably jet or rocket engines. Naturally, the sensational news that the Air Force believed that it was about to solve the two-year-old flying saucer mystery exploded like a bombshell in the Baltimore papers on the morning of the 20th. The wire services picked up the story and broadcast it nationwide, and before long reporters were besieging the Pentagon with questions. But By Saturday evening, holes were already beginning to appear in the story. 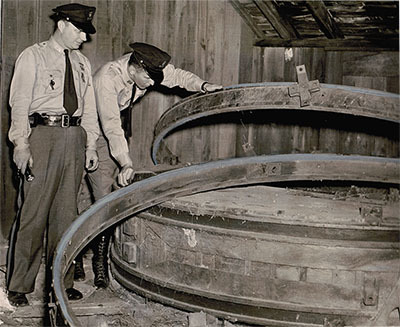 The rival Baltimore News Post's Washington staff discovered that the notion that Caldwell's machines were the original flying saucers was far from universally accepted. In proper Truman-era form, another Air Force spokesman bluntly told the News Post's reporters that the Glen Burnie machines had nothing to do with flying saucers. But the original anonymous source stuck to his guns. "The consensus is," Officer X insisted, "that it is highly possible that Caldwell - or his son, for Caldwell is now an old man ... continued the development of their strange flying machine elsewhere ... the discs that have been reported seen in the air in this country and all over the world, could have been improvements on Caldwell's original idea." Officer X hedged a bit about the rumor that the Air Force was sponsoring a manhunt for the inventor. "We are greatly interested in finding Caldwell and his son," he said, "but, so far as I know, no general alarm has been sent out for them to be picked up. After all, we are a military agency and he is a civilian." By Sunday morning, the Air Force hierarchy had rallied and was on the counterattack. "AIR FORCE REVERSES ITS POSITION ON GLEN BURNIE 'FLYING SAUCERS,'" the headlines screamed. "The Air Force states that the two experimental aircraft found near Baltimore, Md. yesterday have absolutely no connection with the reported phenomenon of flying saucers. Neither its configuration nor its reported characteristics of flight would qualify it to be related to the reports of flying saucers." The spokesman said that the Air Force's public information staff in the Pentagon had watched in consternation as the Caldwell story had built up over the course of the previous day and had been swamped with calls from reporters all over the country clamoring for information. Finally they decided to draft the denial statement and pass it to the Director of Air Force Intelligence (no less than General Cabell himself) who "bought it as it is" and authorized its release to the media. The previous day's statements by Officer X were unauthorized and in no way official, the public information officer said flatly. (The beleaguered public relations officers declined to reveal the name of the officer who "talked out of turn", but admitted that he wasn't on the public information staff, "much to the relief of the whole staff.") Cabell's staff hadn't actually seen the craft in question, but the Pentagon spokesman said that photos and drawings were being made for the Directorate of Intelligence's-- and presumably, Wright Field's -- analysis. The Sun story went on to point out that "this was apparently the second discovery reported by official quarters of 'flying saucers' in the past two years," the first, of course, being the Roswell Army Air Field press release on July 8, 1947 claiming that pieces of a crashed disc had been recovered by base intelligence officer Major Jesse Marcel. (Ironically, Marcel apparently had been transferred from Roswell to Bolling Field in Washington just days before the Glen Burnie flap). Kenneth Arnold, the original saucer witness, was even asked for his opinion about the Glen Burnie machines. Arnold doubted that the objects would help explain the flying saucer mystery, but said that he was still "mystified" about saucers, which he admitted might come from "anywhere." He said that he knew inventors who had experimented with similar designs in the early 1930s and "never got the kind of performance the flying disks do." Firmly quashed by the Air Force, the story quickly evaporated. The Sun dropped its investigation, and within a few days Jonathan Caldwell and his saucers had receded back into obscurity.